Seven and a half hours of waiting, for six seconds of excitement… That is what Saturday boiled down to. It was the classic scenario of “hurry up and wait… and wait… and wait,” where all I was told was that “We know this is going to happen some time today, but we’re not sure when,” but when didn’t really matter it was the what and why that made this a fun hunt. 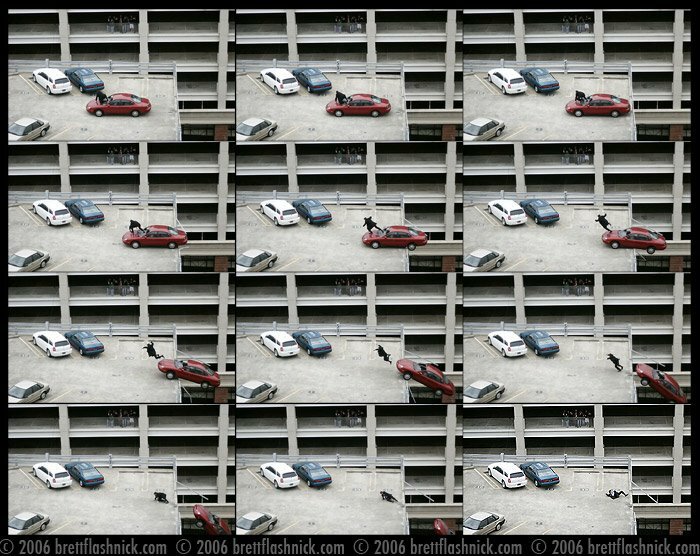 The movie “Death Sentence” is being filmed in Columbia, and on Saturday they were going to drop a car off of the top floor of a parking garage in the middle of Main St. In LosAngeles, the fact that they were doing a movie stunt wouldn’t have even gotten a blip on the radar, but in Columbia, S.C. its big news, so I had to do something big with it. I talked my way into the South Carolina Health and Human Services building, which sits adjacent to the parking garage, and picked my location, the 9th floor mens restroom. As the crew was setting the car and cameras below me, I began placing remote cameras in the windows, covering the lenses with gaffers tape to cut down on glare, and making sure everything was set. Its one of those shots that you don’t get a second chance with, so no screwing up. Reggie, the head of security who had let me into the building, poked his head in the door around 2pm and said “They just called the 30 minute warning.” After seven-hours of standing around on the street corner, the parking lot across the street, and in the mens restroom, every movement on the parking garage below got my coplete attention. Through the tinted windows I could hear the director call “Stand By” and a few seconds later “Action”. As the car began to roll I fired both cameras simultaneously, and didn’t stop until I heard the car crash on the asphalt below. See the Sequence I guess there is something about dropping stuff off of high places that excites us as people, not to mention the fact that when the movie comes out, I can say “hey I saw that happen” and I have the pictures to prove it.